Are you considering Infusionsoft in your business? I’ll be honest, this isn’t for everyone and I want to make sure that this is the next best step in your business to take you to the next level. In fact, I’ve said no to other business owners who aren’t ready as this isn’t for everyone. However for the right business, this can accelerate your business success, by automating workflows, capturing more leads, nurturing prospects more effectively, processing sales, delighting your customers through your delivery, upselling and gaining referrals. 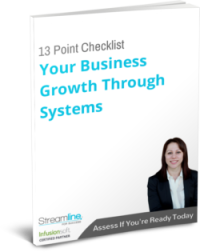 Download free checklist to help you assess whether this might be something you should be considering in your business. If you’d prefer to speak to someone to discuss your specific needs further, book a time in my diary today.